After a very long time of wishing that Ameba Pico release Vocaloid someday finally came true!!! 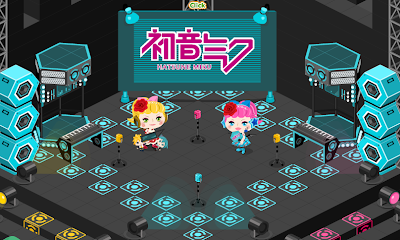 I've always wanted them to release Vocaloid just like Ameba Pigg. Ameba Pico is quite late, though... it's still fine. It made me so happy because people could finally cosplay in Virtual world! Check out the park to go and check the newest stadium! It's the first ever big stadium in Ameba Pico! On the area, you can also check out the shop and gacha to get awesome Vocaloid items also, get a chance to get the Vocaloid drinks of Hatsune Miku, Megurine Luka, Kagamine Lin and Kagamine Len drinks for free by asking your friends to send you back(facebook users only). And lastly, don't miss the special item for this time!! Purchase 1500+ Ameba Gold and get a chance to get a super cute Hatsune Miku Doll! !